The pulp and paper industry and the wood product industry in Finland together produce three million tonnes of softwood bark as waste every year. Most of this is used in energy production, but useful raw materials can also be extracted from softwood bark to create bio-based products and materials. Rehap partner VTT has developed a method to extract a high yield of tannins from bark. Softwood bark is available in significant quantities, not just in Finland but in a number of locations across Europe, and it has a lot of potential when it comes to the opportunities it can provide the future bioeconomy. VTT has developed a method to extract high yields of pure tannins from softwood bark for use as a raw material for producing resins used in wood products and other material applications. The residual fibre fraction can be used to produce sugar for fermentation products. Traditionally, tannins are extracted from the bark by hot water extraction. The extraction yield will differ slightly depending on the origin and processing history of the raw material, but it is usually fairly low. For example, the yield from Scandinavian spruce and pine bark is around 10 per cent of the bark's weight. 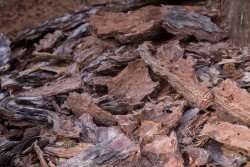 In addition, using the leftover bark residue as a source of sugar through enzymatic hydrolysis produces low yields, with much of the tannin and carbohydrates in the bark remaining unused. The new process developed by VTT closely resembles the kraft process used to convert wood into wood pulp, using higher alkaline conditions and higher temperatures than hot water extraction. One third of the bark's weight can be isolated as a much purer tannin fraction through this process. The fibre fraction can also be hydrolysed far more easily than after hot water extraction. VTT is a key partner in the EU-funded Rehap project, which is looking to create high-added value products for the construction industry from the agroforestry waste available across Europe. VTT has been developing the extraction, fractionation and purification protocols for the recovery of tannin, lignin and sugars from softwood barks. BBEPP, FORESA and BIOSYNCAUCHO, all Rehap partners, also participated in the development and validation of the new patented process and the resulting fractions.